I am nothing short of fanatical about my body oils, and given my penchant for them it should come as no surprise to you that my very favorite luxury body oils are made by African Botanics. They make three of them, and they are all exquisite. During the warm moths of the year, I can forgo any other moisturizer than these lovely oils, but I often use an additional body cream or body butter for even more luscious moisture. Selecting a body oil that best suites your needs or desires is essential. The African Botanics Marula Firming Botanical Body Oil is the perfect choice if you want to lift and firm your skin, The African Botanics Stretchmark Botanical Oil is a perfect choice if you have stretchmarks, and the African Botanics Shimmering Gold Body Oil is a great choice if you are going out day or night and want a stunning ethereal glow. African Botanics Marula Firming Botanical Body Oil ($90.00 for 3.4 oz. from African Botanics, Space NK US, Bloomingdale's, Credo Beauty, Beauty Bar, SkinStore.com, Dermstore, Net-A-Porter, SkinCareRX and Violet Grey): This is an antioxidant-rich moisturizing and firming oil that makes my skin look and feel utterly amazing. This is essentially an incredibly luxurious, potent and ultra moisturizing antioxidant rich anti-aging oil serum for the body. The idea is to treat your body as you do your face to keep it moisturized, dewy, radiant and protected all year long. This is my very favorite body oil because it does so much more than simply moisturize the skin, but it also does an extraordinary job moisturizing. My skin is left deeply hydrated, luminous, lifted, firmed, toned, and more soft and supple than I could have imagined possible. 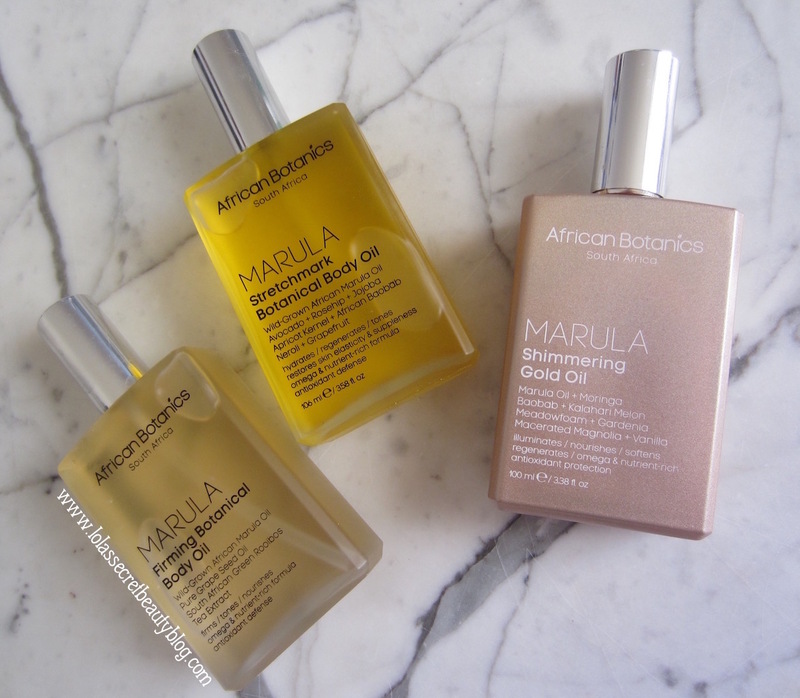 African Botanics Marula Stretchmark Botanical Body Oil ($105.00 for 3.58 fl. oz. from African Botanics, Space NK, Violet Grey, Bloomingdale's, Cult Beauty, Skin Store, B-Glowing, Ahalife and Skin Care RX): While the perfect choice to treat and prevent stretchmarks or scars– it is likewise the ultimate collagen-boosting, antioxidant, vitamin, mineral and essential fatty-acid-rich moisturizer that leaves skin deeply nourished, hydrated, soft, supple, firm and lifted. It effectively prevents, and treats stretchmarks and scars, but generally firms, lifts and improves the texture of the skin. The benefits of this magical potion by far exceed treating stretchmarks and scars, but if you are pregnant and want to avoid getting stretchmarks, then you definitely want this body oil because it is both safe and unbelievably effective. African Botanics Shimmering Gold Body Oil ($105.00 for 3.4 oz. from African Botanics, Space NK US, Violet Grey, Net-A-Porter and Beauty Bar): This is a magical antioxidant-rich and unbelievably nourishing and hydrating oil that can be used from head to toe. In the hair it offers conditioning and tames frizzies while adorning your tresses with a gorgeous golden luminosity. This delectable nourishing oil hydrates and smooths the skin while giving it the most gorgeous and refined shimmer. Skin is left luminous, soft, supple and utterly quenched. Of all of the shimmering oils that I have seen flood the market none compares to this one. It's perfect all year round, but it is the one to try this summer. The subtle scent is an intoxicatingly delicious blend of Gardenia, Magnolia, Neroli and Vanilla Bean that is so delectable that I would wear it as a perfume given the chance. The Firming Body Oil sounds perfect for me though the gold shimmering one would be so much fun! All three are really first rate, and the Shimmering Gold Oil is so luscious for the summer! A+ rating?! I need to find these!! I've never really used body oils before, but these sound like they have amazing benefits. They really are that amazing, Stacie! Their oils are such a treat to use. I love using body oils, and layering them under lotions, creams and body butters is such a amazing way to pamper the skin. You always make these sound so enticing. Their products are absolutely outstanding. This is a game-changing brand, no question. It's really effective– plus all of their oils are amazing in every possible way. Ultra-luxe and such a joy to use! I'm loving the packaging of the African Botanics one -- so shimmery! Their packaging is exquisite, no doubt. Yes, the Shimmering Gold Oil is fantastic! I love oils! They are so luxe and amazingly hydrating for the skin, especially super dry skin like mine! Me too, and these are truly exceptional, and worth trying!